Principle: BARDOT Ocean’s OTEC technology uses pumps to bring in large volumes of cold and warm water to feed the exchangers of the system. The warm surface water (20-25°C) is flowed through heat exchangers that transfer the heat to a closed circuit and boil a working fluid into vapor under pressure at 19°C. The vapor then expands through unique turbines which then drive generators and create electricity. The cold water (4-7°C) is pumped up from depths of 700 to 1000m and flowed through exchangers to condense the vapor back to its liquid state. The cold liquid working fluid returns to the evaporators where it is heated and boiled all over again. Used waters, both hot & cold, are then sent partially back to the ocean. To avoid any environmental impact, waters are rejected at depths corresponding to their temperature. A small volume of the cold water can be used to create cold through a Sea Water Air Conditioning (SWAC) system or fresh water through a Sea Water Reverse Osmosis (SWRO) system. With our system we have a 100% green integrated energy system for your building. 1 – Cold water intake pipe, may go down to 1000m depth, to reach down to 4°C. 2 – Hot water intake pipe, usually located in the lagoon, or on shallow waters. 3 – Water rejection pipe, at specific depths to eliminate environmental impact due to temperature difference. 4 – Pumps, for large volumes of water, designed to consume the minimum energy to operate. 5 – OTEC closed loop, including heat exchangers made of titanium and our revolutionary ORC turbine. Thanks to various manufacturing sites worldwide, Bardot Group is able to produce OTEC solutions close to where it is requested and helps you optimise your local content and project logistic. Our expertise in composite manufacturing allows us to reach custom-made solution and flawless product quality, to deliver timely the best product to our clients. Bardot Group’s OTEC systems are designed according to the environment particularities. A custom made installation procedure is provided for each OTEC project to ensure the proper assembly of your system. Calculations for the installation are performed by our engineers to validate our installation procedure. 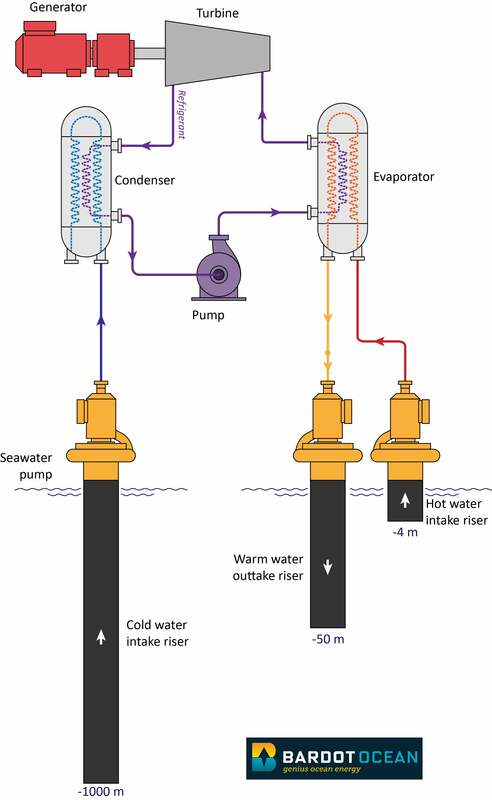 Custom made design: Ocean Thermal Energy Conversion systems are designed to fit your requirements of water depth, temperature, flow rate, temperature and to accommodate the hydrodynamic stress of your operation environment. Long-lasting: Materials used have been selected for their good behavior over time. Our design conservatively considers end of life properties, and guarantees that no maintenance will be necessary. Light structure: The low weight of our solutions is designed to facilitate installation. Modular strapping system: Our wide range of strapping systems provides adapted solutions to fit with your environmental loads and project life. Environmental Management will be main priority of the project.